Roast beets in an aluminum foil pouch in 400′ oven or grill, until just tender, about 40 minutes. Let steam in pouch for 10 minutes. Cool, then peel and cut into bite size pieces. For dressing, whisk together vinegar, mustard, honey and garlic. Slowly whisk in oil and season with salt and pepper. 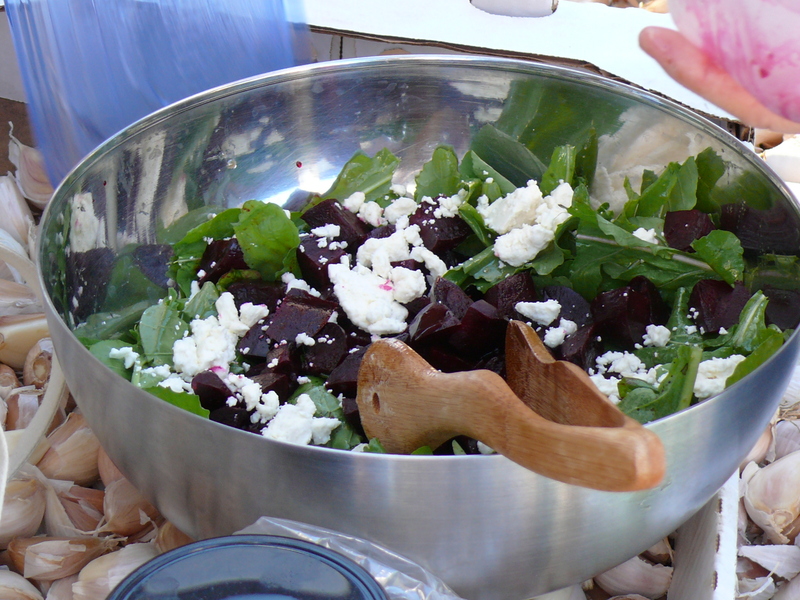 Mix beets with some of the vinaigrette. Mix greens with vinaigrette to taste. To serve: Put greens in large bowl or on plates. Top with beets, cheese and nuts. Peel and boil 15-16 potatoes. When tender, drain. Add a half stick butter to the still hot potato pot and return the potatoes to the pot for mashing. You can make the mashed potatoes to your liking, however, mine included half-and-half, sour cream, skim milk (to thin them out a bit) and salt & pepper to taste. Melt 1.5 sticks of butter in a pan and sauté 2 chopped onions until soft. Mix half of the onion/butter mixture with the mashed potatoes. Add 1 ½ cups shredded cheddar cheese to the mashed potatoes and onion mixture. Grease your casserole dishes and add in one layer of pasta. Add half of the potato mixture and spread to cover the lasagna noodles. Add half of the reserved onion mixture and spread to cover the potatoes. Put on another layer of pasta, and repeat potato and onion layers again. Finish with a layer of the lasagna noodles – and to top it off, melt 3 Tbls butter to spread over the top of the noodles and prevent too much drying. Lastly, as a suggestion to incorporate something healthier into all that butter…you can sauté any finely chopped greens (kale, spinach, collards, chard) in olive oil with some garlic, salt, & pepper, and include that in the layers. (This was my intention with some of the kale, but the sautéed kale ended up being so good, we just ate it on the side and it never made it into the casserole!) ENJOY!!! 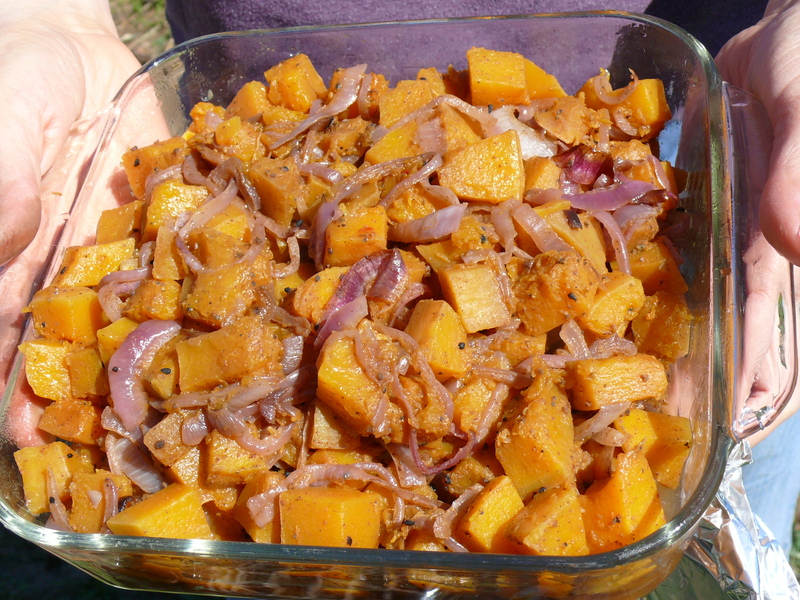 Roast, tossing about halfway through cooking, until squash and onions are tender and slightly browned, about 25 minutes. Transfer vegetables to a serving platter or bowl and sprinkle with cilantro; toss to coat. Yields about 3/4 cup per serving. Stir together all ingredients. Preheat oven to 400°. Grease and fill muffin cups. Bake for 25 minutes. Batter may be stored in refrigerator in airtight container for up to a week. Bake a few each morning for warm, fresh muffins. 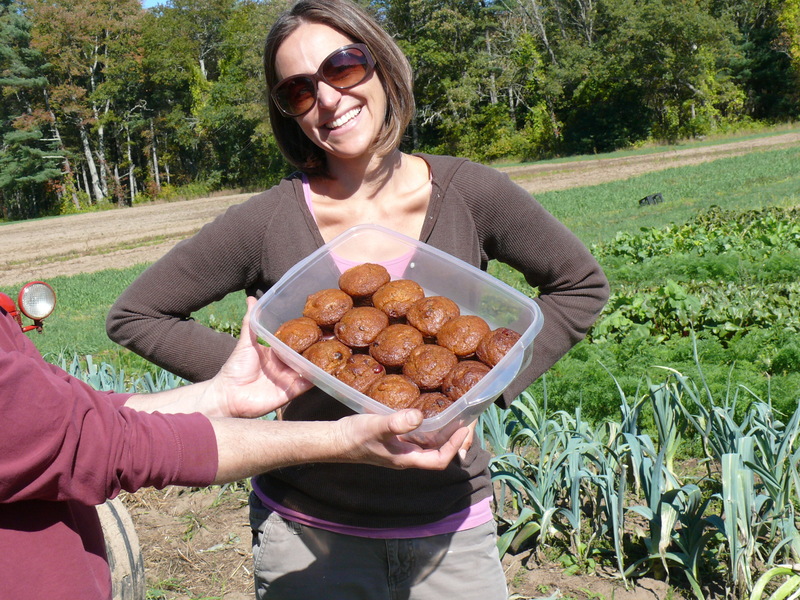 I have also made zucchini bran muffins, substituting shredded zucchini for pumpkin in this recipe. Mix the shredded zucchini with the sugar and allow it to macerate (become liquidy) before adding to recipe. In a large saucepan, bring rinsed quinoa, stock, a dash of salt & water to a boil; Reduce to a simmer & let cook for 20 minutes. If there is any excess liquid, drain it, but don’t rinse. Add remaining ingredients & toss to combine. Season with salt & pepper. I just wanted to pass this recipe along to our fellow CSA members. Dave and I made it tonight and served it with some crusty bread- it was simple and delicious and a great way to use some of the wonderful tomatoes and cukes we’ve been getting from the farm. Hope you all like it! Cut tomatoes in half and place in a large bowl with other salad ingredients. With the food processor running drop in whole garlic clove and mince. Turn off processor and scrape down sides, add cilantro, olive oil, lemon juice, salt and pepper. Pulse to combine. Drizzle dressing over salad and toss to coat. Next recipe is a creation by Steph using most of the ingredients we wind up coming home with at the end of the day. Other than a lot of chopping, it’s very simple to prepare, requires no cooking, and is a great side or lite lunch. a couple cukes, 4 radish, 3 sweet peppers, sweet onion, some cherry tomatoes, chive, dill, salt, pepper, and optionally a hot pepper. Mix with a vinegar (Steph uses red wine and cider). Let sit overnight. That’s it! I slice them in 1/4″ thick rounds, or at a slight diagonal for ovals, lay a single layer in a colander, salt, then keep layering until you have way more than you need. Let them sit and sweat for twenty minutes or so, pick them up individually and let drip, then put 3 or 4 at a time in a big paper bag with flour, shake, then lay them in beaten egg and fry in olive oil at medium heat. I take them out of the pan and lay on a stack of paper towels, and make multiple stacks on top of each other. Salt and eat. They’re great in a sandwich with cheddar and mayo. They’re good for several days in the refrigerator, and the rest I put on a pizza tray, stick in the freezer, then stack in a ziploc bag once they’re frozen. They’re great toasted in the middle of the winter! From our own Meredith of Artisan Kitchen who provides us with the DELICIOUS breads! Saute sausage to render and get crispy. Remove from pan and add onion, sweet pepper, garlic, and season with salt and pepper. Saute medium heat for 5-8 minutes until soft. Add stock to deglaze brown fond bits from the pan. 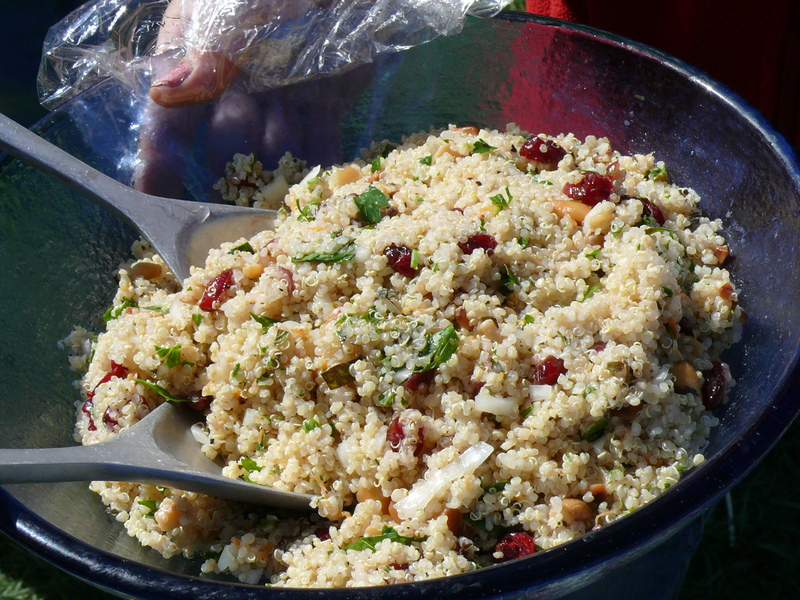 Mix in parsley and bread crumbs. You may need more stock if the mixture is dry. Mix until the stuffing sticks together but not gluey. Stuff inside long trough in the zucchini then sprinkle with cheese and wrap in foil lightly (use pan spray on the side of the foil that touches the cheese to avoid sticking). Place on grill preheated to medium-low heat. Grill on top rack for 25-30 minutes until the zucchini is fork tender. Test by pressing a fork through the foil and into the squash. Serve hot with a green salad and a thick slice of bread (of course)! 4 Medium Summer Squash or Zucchini, about 2 lbs. ¼ c. Fresh Basil, chopped1. Cook bacon in a skillet over medium heat until crisp, about 8 minutes, then drain on paper towel. 3. Adjust oven rack to about 4 inches from heating element and heat broiler; broil bread slices until golden brown on both sides. Brush both sides of each slice with oil and rub with garlic clove. 4. Combine squash and/or zucchini, vinegar, 2 T. oil, salt, and pepper in medium bowl; let stand 5 minutes, then toss in bacon, cheese, and basil. 6. Divide mixture evenly among bread slices; broil bruschetta until cheese begins to melt, about 1 1/2 minutes. Serve immediately. As most of you know, blight has hit the region impacting tomatoes and potatoes. So although you’re getting potatoes now, that may not continue and the ones you do receive need to be eaten quickly – not stored. So I thought I’d share a very simple but very tasty way to cook up any of the potatoes you’re receiving – red, purple, or gold. Slice the potatoes into fairly thin slices – maybe a quarter inch. Do the same with some sweet or yellow onions. but them all in a cast iron skillet, coat them up with olive oil and cover with foil. You can do all of this in foil if you don’t have a skillet. Then stick them on the grill at a med/high heat (or roast in the oven if easier). Should take 20 – 30 minutes depending on how much you have in there. The flavor is wonderful and those on the top and bottom brown up nice. enjoy! This recipe came from a very close friend of mine, Connie Culp, who we lost to cancer in 2003. She loved food and gardening, and was an incredible cook and woman. Saute the following: 1 medium onion, 1 garlic mashed, 1/4 cup oil. Beat the eggs. Mix all together in a bowl. 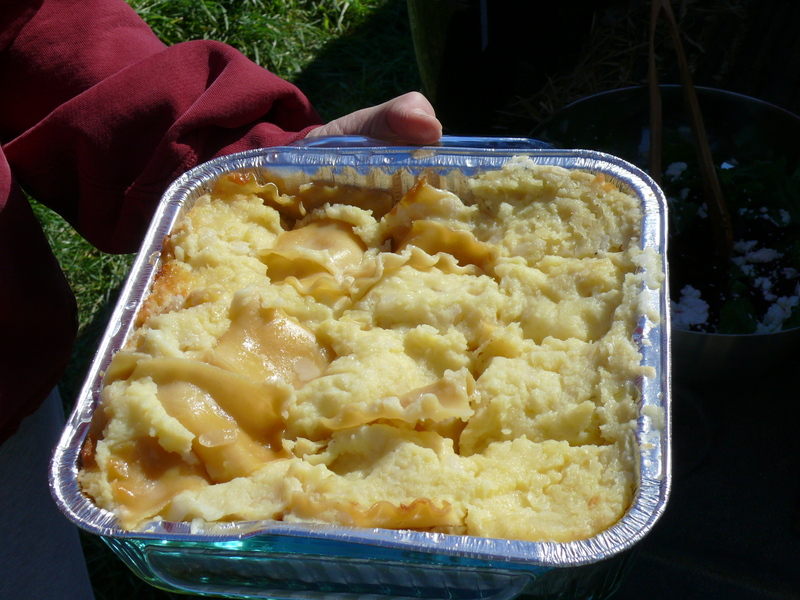 Place in an 8″ baking dish and top with cheese. Cook for 30 minutes in 350 degrees. If you like, include mushrooms in the mix. For this week we offer you Sasha’s Mom’s famous red cabbage slaw! (although I’m sure Sasha’s Mom got it from somewhere, we’ll give her credit!) For those of you that helped out on transplant day, this was the delicious slaw we had. OMG – Farmer Dave, you have great taste! We tried the recipe for “Kagoots” tonight & they were a huge hit. Super delicious! Where did it come from? Thanks Colette… glad you liked them! Dave’s family always made this. And he tells me I got the spelling wrong. He says it’s something like ‘kogut’ and that it means zucchini in Italian… I tried to google it though and can’t find anything. Courgette is French, I think, for zucchini. Could that be what he was thinking??? I think they were referring to cucuzza. Did he mean “courgette”? That’s the French word for it. I think zucchini is just zucchini or zucchina in Italian. In the last episode of The Sopranos, Tony asks Carmela, “Where’s googootz?” “Googootz” is an Italian term of endearment; Tony was referring to his son, AJ. “Googootz” is also the Italian slang for “zucchini,” and refers to a squash-like vegetable that Italians and Italian-Americans grow called cucuzza. Hi, I am writing a poem about my grandfather and his garden. He used to call zucchini something like: “googazieles”…. and I am trying to get a proper phonetic spelling in Italian slang that would make sense. As of now, I like that spelling…. but if anyone here is more familiar with Italian, can you point to any problem areas phonetically speaking? I think the “googa” works, but I’m not so sure about the “iele” at the end. Feel free to send me an email with any thoughts… Thanks!